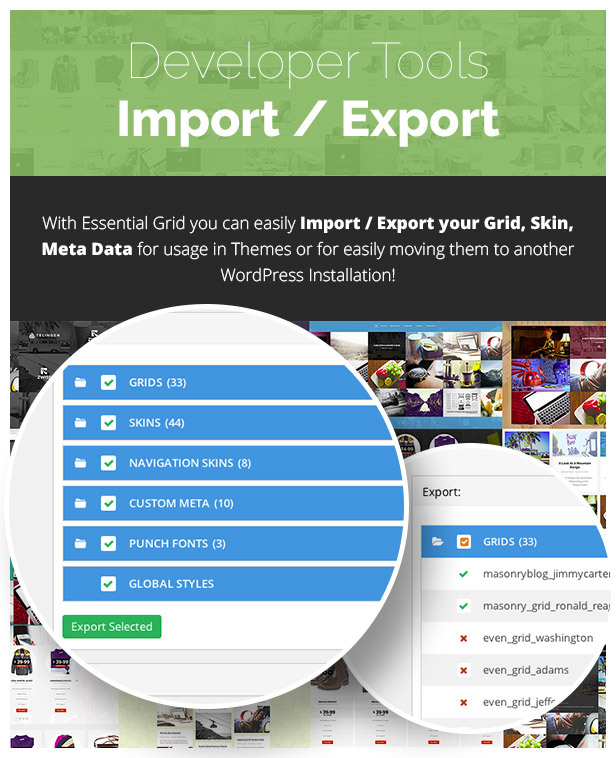 „Essential Grid“ is an all-purpose grid building solution for WordPress that allows you to display different kinds of content in a highly customizable grid. 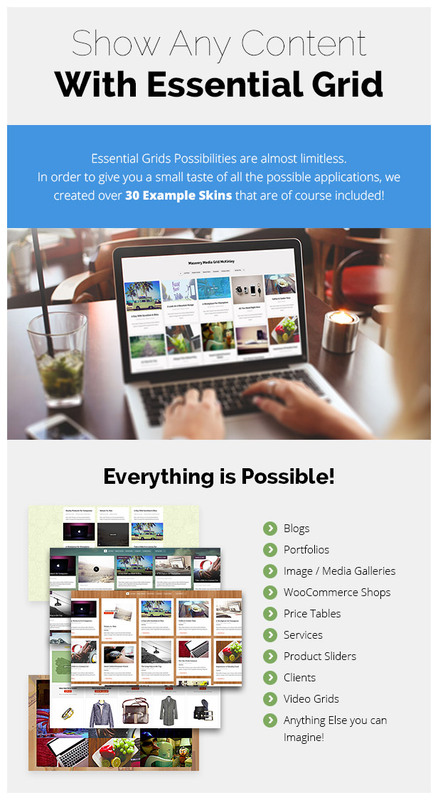 Possible applications range from portfolios, blogs, galleries, services, product sliders, testimonials and anything else you can imagine. 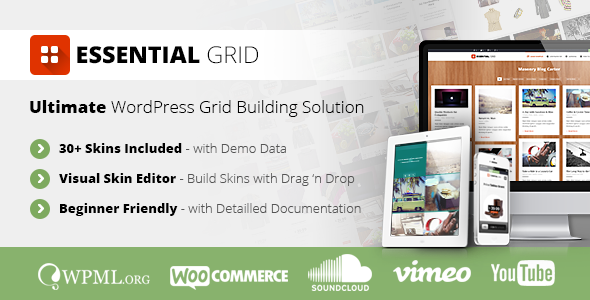 With it’s various supported media types like images, youtube & vimeo videos, html5 self- hosted videos and even iframe content, „Essential Grid“ will breathe life into your WordPress site! First you have to decide which source you would like to use for your grid entries. Your grid can consist of WordPress blog posts, custom posts, WooCommerce products or a regular image gallery. You may also fine tune your selection by specifiying categories or tags. Then, customize the grid to your liking by selecting a boxed, full-width or fullscreen layout, adjusting the displayed number of columns and rows and setting item spacings. Navigation can easily be added to your grid using our drag & drop system. In the next step, you can select one of over 25 skins included with the plugin to determine the look of individual grid items. 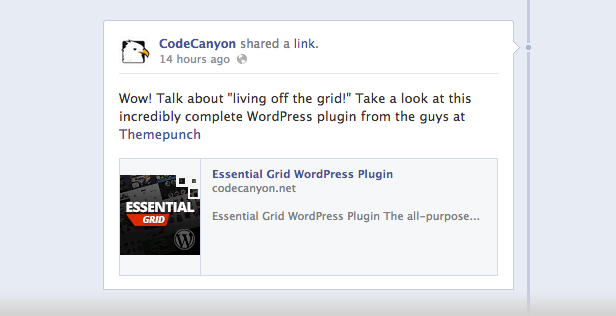 Your finished grid can be added to any area of your wordpress site using a simple shortcode. Yes, it’s that easy! 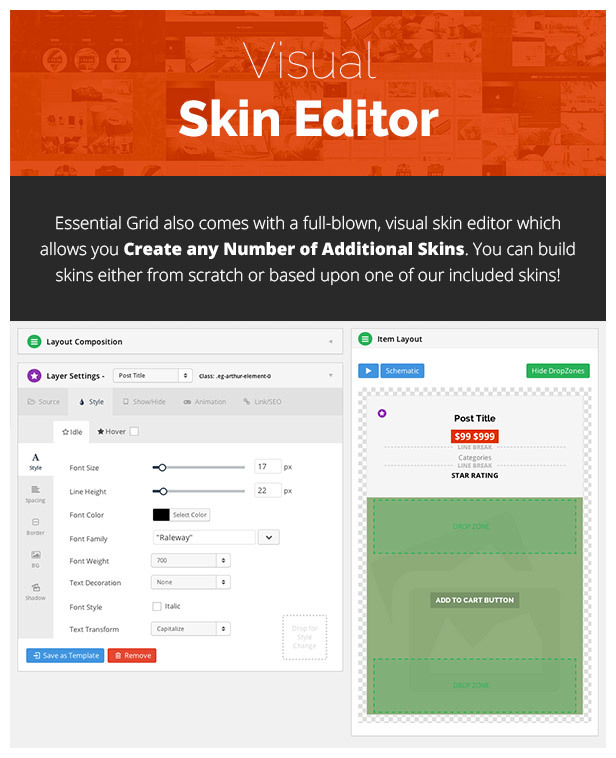 „Essential Grid“ also comes with a full-blown, visual skin editor which allows you create any number of additional skins! You can build skins either from scratch or based upon one of our included skins. With the skin editor you can style elements in a „what you see is what you get“ environment. It’s even possible to add various animations to any element and take a look at the results right away! Amongst the more advanced features of „Essential Grid“ is the ability to generate custom metas. A custom meta is essentially another option added to a WordPress post, containing for example, an additional text or image. In that way, you will not be limited to the standard content of a post! One revolutionary aspect of „Essential Grid“ is a feature we call „Custom Post Based Skin Modifications“. With this neat little trick you can add special rules to change a skin elements style for specific posts only. An example for this would be highlighting a certain post in your grid by giving it a colored border. Our goal at ThemePunch is to create products with unparalleled customization possibilities and great usability at the same time. „Essential Grid“ makes no exception and we put a lot of thought into how to to make it accessible for beginners and still offer all the bells and whistles for the experts! The result is a plugin that allows the user to produce very quick results, yet at the same time is not limiting the ability to customize every aspect of the grid. 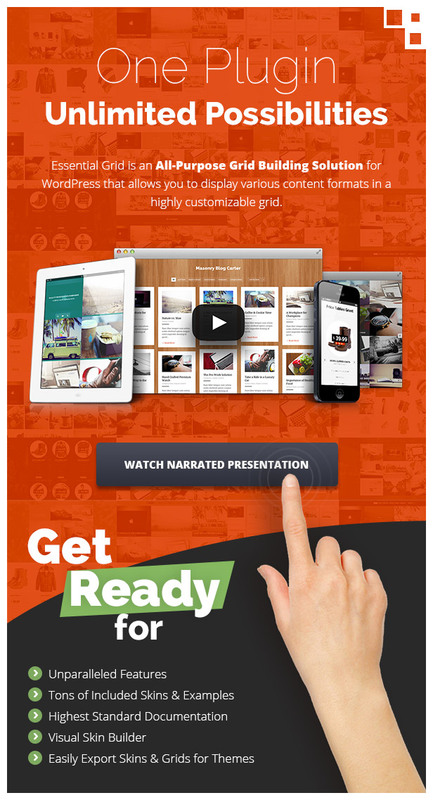 If you want to grasp the full potential of „Essential Grid“ make sure to check out all the examples on our demo page. As always, if you have any questions concerning our products, don’t hesitate to contact ThemePunch via Email, Facebook or Twitter! 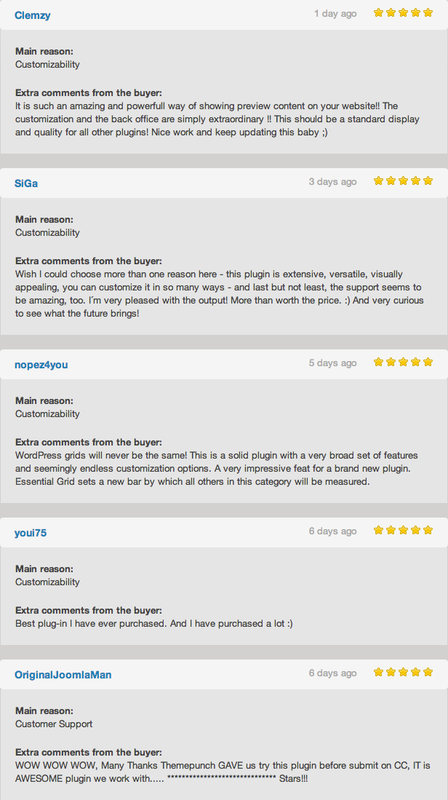 This entry was posted in Wordpress Plugins and tagged blog, download free, download wordpress theme, filter, flexible, free, free wordpress theme, full width, gallery, grid, image, lightbox, masonry, nulled, nulled theme, portfolio, responsive, skins, video, visual editor, woocommerce by wordpress. Bookmark the permalink.